Freelancing is on the rise and for a good reason. With more people deciding to leave the 9-to-5 for remote work, the demand for freelance job sites has increased greatly. You don’t have to brave the traffic every day when you can do all your tasks in the comfort of your living room, thanks to technology making remote work so accessible. 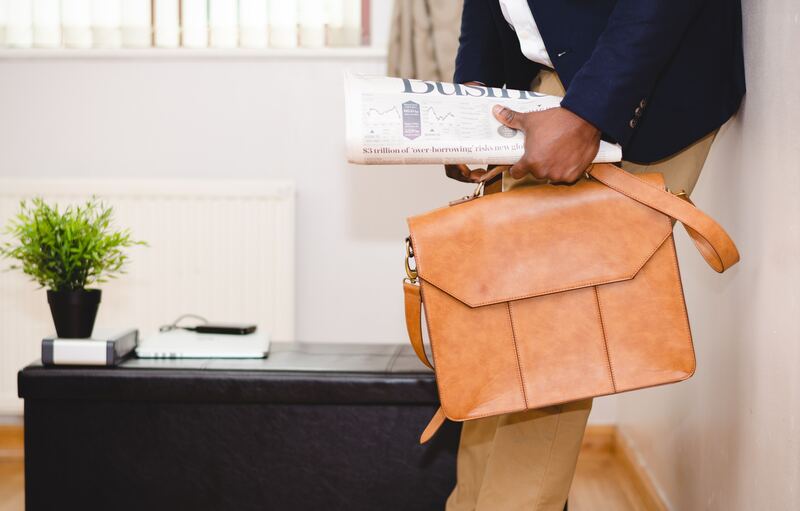 Even before this sudden surge in the availability of freelance professionals, freelance job sites were already around to help freelancers find clients and earn from freelance work. Below are the top 64 freelance job sites you can go to should you decide to join the gig economy. Flexjobs makes a great effort to screen all the telecommuting gigs it offers freelancers, giving everyone the assurance that the projects they’re applying for are all legit. This freelance job site offers an array of projects ranging from freelance to part-time gigs. They also provide freelancers access to useful resources like webinars, skill tests, and freelancing tips to help them brush up on their skills and land clients more easily. SolidGigs is an excellent alternative for finding freelance gigs on freelance job sites. Unlike many of the other freelance job sites, SolidGigs does the work for you by finding all the best freelance jobs available and sending them directly to your email. How easy is that? You can try SolidGigs for just $2—such a small fee for the amount of time you’d save from doing it yourself. 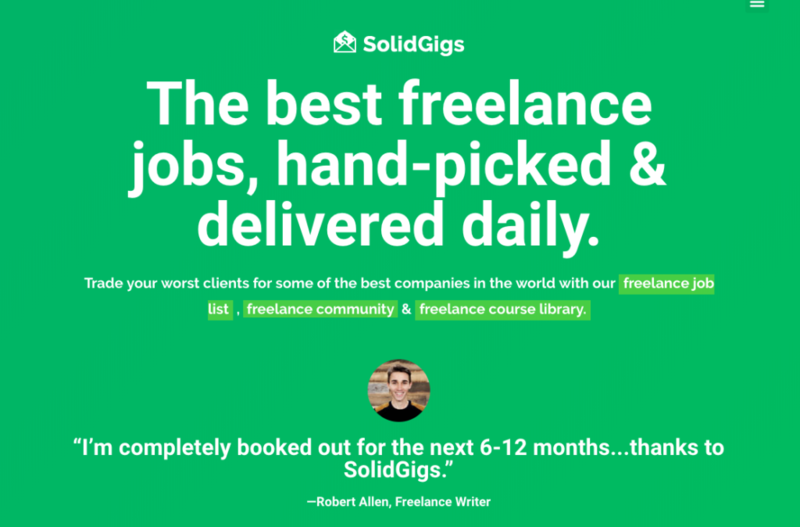 Also, Solidgigs has a thriving freelancer community forum and a giant library of quality courses, templates, scripts and other tools to help you grow your freelance business. FreeeUp is an up and coming freelancer marketplace that prides itself on connecting clients with the top 1% of freelancers in the market today. With its extensive 5-step interview process, clients are assured of getting high-quality, pre-vetted freelancers who specialize in ecommerce, digital marketing, and virtual assistance, among others. With a massive roster of pre-vetted freelancers located in different parts of the globe, clients will enjoy the easy and quick hiring process that this freelance job site offers. FreeeUp also offers above-average compensation to freelancers while still offering reasonable client rates, making the platform a win-win for freelancers and clients alike. 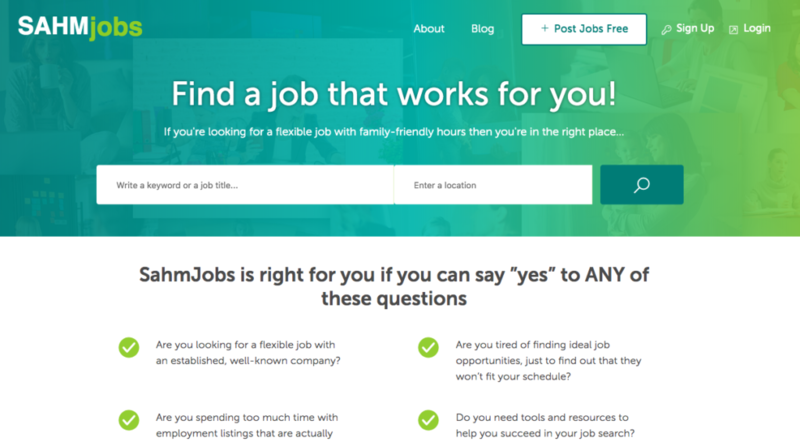 No freelance job sites list will ever be complete without the one that started it all. Considered the biggest freelance job site on the internet today, Upwork offers just about any kind of freelance work there is. With over 1.5 Million clients under its belt, Elance and Odesk’s lovechild is definitely a haven for just about any type of freelancer due to the wide range of skills it supports. With over 3 Million freelancers in its pool, GURU is considered one of the largest freelance job sites today, right up there with Upwork. It’s a good place to showcase your talents and past work while gaining access to new jobs every day. GURU also provides freelancers information on how much a company has spent on the platform, helping you decide if the client is a good fit or not. Just like other freelance job sites, GURU lets you choose between hourly or fixed project types as well as location and other filtering options. If you are an experienced software developer or designer, Toptal is the best freelance website to find freelance work. This freelance site only accepts the top 3% of candidates using a strict and extensive interview process that assures clients that they are getting the cream of the crop. The platform also prides itself in giving freelancers above-average compensation and an impressive client list that includes the likes of JP Morgan and Airbnb, among others. While it’s common for freelancers to apply for projects on freelance job sites, Fiverr does it differently. Instead of applying for projects, freelancers market themselves to get hired. Freelancers post their gigs in different categories and just like a buffet table, clients come to choose which one fits their needs and budget. All freelancer gigs start at $5 (thus, the name Fiverr) but can go up depending on the requirements and complexity of the project. People per Hour works a lot like Fiverr in terms of the selection process, though they do offer higher pay. The gigs you’ll find on this freelance website are diverse but mostly require graphic design, coding, writing, and SEO. Founded in 2007, this UK-based company is considered one of the most popular freelance job sites today. In 2012, the company was named one of Europe’s 100 Hottest Startups by the science and technology magazine, Wired UK. Whether you are a sales rep, a graphic artist, or a construction worker, this freelance job site will surely have something for you. With over 24 countries and 12 languages to choose from, this freelance site has so much to offer no matter what skill you might have. The SimplyHired freelance website also has a blog that provides hiring tips and location-based searches to make the job-hunting process a lot easier. Just like the other freelance job sites, iFreelance covers pretty much the same type of freelance skills like coding, graphic design, writing and social media. What makes the platform different is that unlike the others that have fees and varying rates, freelancers are allowed to keep 100% of their earnings making it an attractive choice for freelancers worldwide. Apart from providing freelancers opportunities to work either remotely, onsite, or do contract to hire jobs, this freelance job site helps you hone your skills with free online courses and trainings that freelancers can access at anytime. To find jobs or projects that match your skills, simply search with keywords or provide a location. You can also browse for all of the current job postings in your area to make job hunting a breeze. Working under the motto “It’s Time We All Work Happy,” The Creative Group, now known as Robert Half, is a huge agency that helps freelance professionals find work in the fields of marketing, graphic design, copywriting, and many more. Through their freelance job site, freelancers are given the option to choose between fulltime employment and contract to hire. The company seeks to make both the client and the freelancer happy with the services they provide. What sets FindSideGigs.com apart from other freelance job sites? Its unique approach to providing freelancers with work and projects. The company sends you information on all the latest gigs you’ll find on freelance websites as well as tips on how you can land each of them by becoming one if its free subscribers. Getting a premium subscription gives you an advantage over free subscribers because you’ll be receiving the same information a week ahead, giving you headway in landing the gigs you’re looking for. Founded in 2015, this freelance job site is now home to more than 11,000 freelancers and over 500 clients. By collecting all freelancing opportunities from other websites and advertisements, it helps freelancers find the latest gigs in one place instead of jumping from one freelancing website to another. Crowded’s primary objective is to fix the supply and demand problem for freelance opportunities, which explains its individual approach. Considered one of the largest freelance job sites in the market today, the company’s specialty revolves around content creation and monitoring for media companies and publishers, and more. The platform’s singular approach of breaking larger tasks down into smaller ones sets it apart from its competitors. It also has a reward system that gives freelancers who do a great job added perks like increased compensation and access to more jobs. Freelancer provides freelancers the option to apply for jobs either on an hourly basis or via contests, which is unique to this freelance job site. With millions of projects and opportunities available at any given time, the site is no doubt a great place to start your freelance career. 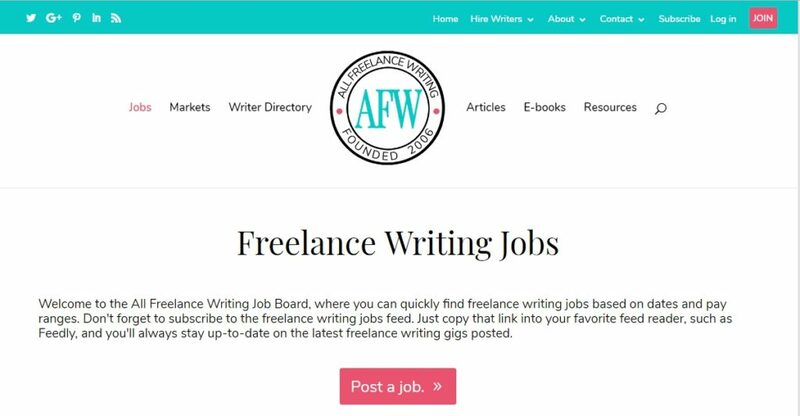 If you’re a writer, blogger, editor, or copywriter, this is the freelance job site made especially for you. The site provides updated writing-related job listings about an array of topics that involve health care, photography, personal development, and recipes (plus many more). If your talents are on the creative side, then Krop is one of the best freelance job sites for you. Krop is considered to be a Creative Industry job board and a portfolio-hosting website that helps freelancers land clients from some of the world’s most trusted brands. The company also has a hand in promoting its talented freelancers to companies in need, apart from providing a platform where creatives can search for jobs. Similar to Freelance Writing Gigs, Contena is another freelance job site dedicated to writers. What makes it different, however, is that it collects every writing opportunity you can find on the internet in one job board, making the job hunting process easier. The freelance website offers free membership as well as Gold and Platinum options that offer additional features like trainings and free coaching. As the name implies, 99designs is a freelancing site specifically made for designers. Unlike the usual freelance job sites which allow freelancers to apply for jobs, 99designs lets designers compete in contests with the prize being a contract with a client. Clients are responsible for outlining all of the requirements for the project, then designers from all over the world have the option to take part. Craigslist is not just a place to find properties and household appliances. It is also a good place to look for freelance jobs. 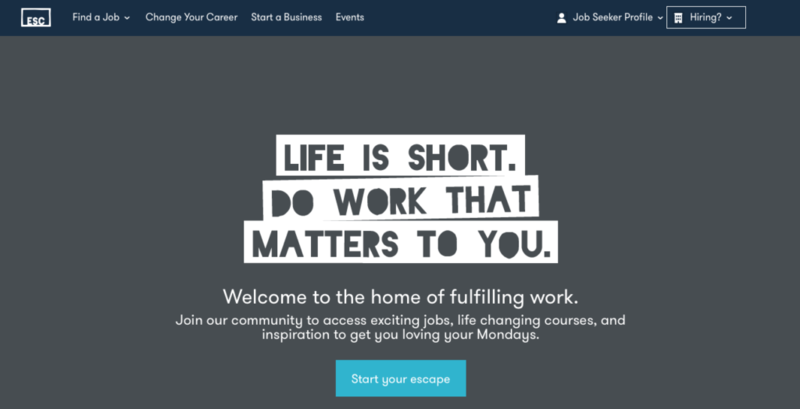 It doesn’t matter if you’re looking for an office job or remote work, the site offers information for both. The site has received a bad rap for the scams reported over the years, so freelancers need to be extra careful. Always conduct in-depth research on clients before meeting them for an interview. We all know what LinkedIn is all about as a social media platform—every professional who aspires to be known has a professional LinkedIn profile available for everyone to see. But LinkedIn has become more than just a social media platform now that it has dipped its toes into the market of freelance job sites. 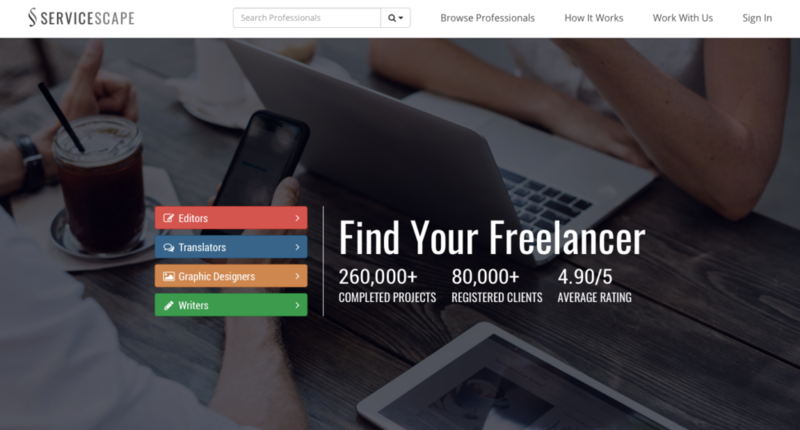 Profinder aims to help freelancers find projects just like the other freelance job sites. With its massive database of users, connecting with clients and other professionals is made easier and less complicated. Design Hill is another virtual marketplace for creatives specializing in digital work. The platform prides itself in allowing clients to provide real-time feedback, giving users a more productive interactive experience. The freelance website allows freelancers to create their own portfolios to show off their skills and hold contests that freelancers can compete for by contributing to clients’ projects. Remote makes freelancing simple and straightforward by connecting freelancers with clients directly. Clients looking for a certain skill set just send a job request to freelancers who match their needs. Freelancers are given the freedom to choose which clients they want to work with. If the client is interested, the freelancer can then initiate setting up the contract’s terms. The freelance job site allows clients and freelancers to communicate with each other, send documents and files, and receive payments all in one place. Remote also helps freelancers get reviews for jobs completed, helping them build a profile and improve their credentials. With Local Solo, freelancers are more in control compared to other freelance job sites. With no commission fees and a totally free service, freelancers only need to create profiles to attract clients. Once a client finds the freelancer that matches his or her needs, they can work directly on setting up the contract, rates and payments. If you’re struggling with questions like how do find writing gigs, what to charge for them and where to actually get started – then Writers Work is the perfect place for you. These guys scour the web to find the best writing gigs and deliver them straight to your dashboard. Writers Work connect freelance writers with clients to enable a hassle-free match. The platform is a perfect starting point for newbie writers but also provides great opportunities for seasoned writing professionals as well. As a global marketplace for service-related commerce, ServiceScape is one freelance job site you want to check out. Whether you’re a company looking to hire a freelancer, or want to become part of their team of freelancers, they cover both sides of the spectrum. With a heavy focus on writers, translators, and editors, each freelance professional has their own profile with a breakdown in their capabilities, costs, and reviews. This makes for an easy process in deciding who is right for your project. Remote.co is a resource for companies that see remote work as an opportunity, from hiring to training to managing distributed teams. Which means their clients are always looking for talented freelancers to join their remote teams. Angel.co lets you apply privately to thousands of startup jobs at some of the most notable companies in the world. While many jobs are full-time opportunities, some high-quality freelance gigs pop up every once in a while. Brought to you by the folks at Smashing Magazine, this job board features design and development jobs almost exclusively. For freelance opportunities, click the button to filter by “Part-time” jobs. Digital Freelancer allows you to tap into their collection of pre-vetted freelance jobs and get straight to doing what you’re good at – selling your value. While the companies on this list tend to be lesser-known, there’s a lot of variety and frequent updates. There are definite pros and cons to Indeed, one of the biggest jobs sites in the world. The good? there are literally thousands of jobs posted every hour by companies of all kinds. The bad? There can be a lot of garbage and it’s difficult to find remote, freelance work. But it’s there if you’re willing to dig. Or sign up for SolidGigs and we’ll do the digging for you. Freelance Wave compiles remote and freelance jobs from companies around the web. And because they charge the companies to post to their job board, they’ve got a built-in filtering system which means less work for you. SkipTheDrive tries to simplify the job search process by providing pre-filtered job listings that allow for work-from-home opportunities. The goals of RemoteOK is to help you find a job that you can do from anywhere in the world. It’s from the makers of NomadList and other resources for freelancers and independents who want to live and work from anywhere in the world. The NoDesk Remote Job Board is all about digital nomads and remote work. They’ve been around since 2015 and been described as a “better Google” for nomad entrepreneurs and an encyclopedia for the remote worker. Since 2005, Authentic Jobs has connected thousands of creative professionals with great companies and outstanding work opportunities including at companies like Apple, NPR, Squarespace, Facebook and more. Escape the City started as a small email to a few friends containing the “top 10” opportunities to “escape” your day job. They’ve now grown to over 250,000 subscribers and have become an excellent freelance website for finding remote & freelance jobs anywhere in the world. As a 100% telecommute company, VirtualVocations understand the unique challenges job-seekers face when looking for virtual work because they’ve been there. Their mission is to help you find legitimate telecommuting jobs quickly, easily and safely. F6S is home to over a million tech founders, 800k startups and more than 10,000 startup programs globally. Which means a lot of people and companies looking to hire talented freelancers. Hubstaff offers a free marketplace for connecting freelancers and employers. While there are lots of opportunities on their every-growing list, many of the gigs can be a bit low in terms of compensation. But every once in a while, you’ll find a gem. Remotive helps remote workers find great gigs with their job list and also has compiled a list of 500+ startups who welcome and celebrate remote work, most of those are actively hiring. The Muse is an online career resource that offers a behind-the-scenes look at job opportunities with hundreds of companies. They believe that you can and should love your job—and be successful at it—and they want to help you make that happen. Working Nomads curates lists of the most interesting remote job offers in many professional career areas. They connect professionals who want to work remotely with innovative companies offering independent positions. We Work Remotely helps you find jobs that aren’t restricted by commutes or a particular geographic area. Many, but not all, are freelance or contract opportunities. Part of Darren Rowse’s legendary Problogger community, this job board is almost exclusively catered to writers & bloggers. While there aren’t a ton of listings, when the listings come through, they are pretty good opportunities. Coroflot claims to have the largest and most active site specifically targeted for the hiring needs of companies. Which means a lot of quality freelance and contract work added to the site each week. Join the private Bonsai gig list and get the latest design, development and writing gigs from the best companies, once a week, straight to your inbox. College Recruiter is a freelance job site specifically made for recent graduates as well as currently enrolled students of colleges, universities, and graduate schools.Established in 1991, the company currently has 10 million students and 7 million graduates listed in their database. With more than a hundred thousand job postings and hundreds of Fortune 1000 companies as clients, the opportunities to land a first gig is almost limitless. Production Hub is a freelance job site that caters to the film and video production industry. The company provides its clients a platform to hire staff and crew for a certain period of time. A cameraman for a week, a video editor for six months, or even a full-time producer depending on the need. Launched in 1999, Production Hub offers an extensive list of both crew gigs and permanent positions. Freelancers are free to go over its job listings without paying a fee but if you want faster results, there’s a monthly option for a basic profile ($4.99) and featured profile ($59.99). ZipRecruiter prides itself as the #1 rated job search app for both Android and iOS. With over 7 million active monthly jobseekers and more than a million employers under its belt, the company is considered one of the biggest thriving marketplaces that cater to millions of people around the United States. The app works similarly to that of other freelance websites. It allows employers to post jobs and view candidate resumes to help them narrow down their search. The service is free for job seekers and for employers for four days as part of the trial period. Unlike other freelance websites, Red Hat generally deals with higher level clients and employs a pool of skilled freelancers who provide a myriad of services. From something as technical as software development to the more general ones like sales and customer service, there’s practically a freelancer available for every skill set required. Now known as All Freelance Writing, the site caters to freelance writers who are looking for writing jobs. The service is free and all a freelancer needs to do is go through the posted jobs until they find the right match. What makes the site effective is its user-friendly navigation, with jobs displayed according to dates and even pay ranges helping freelancers easily sort and decide which jobs they are willing to take. Media Bistro is a freelance website that allows freelancers to search and apply for a variety of jobs under different categories like writing, marketing, and creative gigs. The company prides itself in having some of the most recognized brands as clients, with the likes of HBO, CNN, Bloomberg, and NBC hiring freelancers under them. CloudPeeps is a relatively new freelance job site that focuses on marketing and social media. The site uses the same model as that of other freelance job sites where a client posts a job, receives a proposal, and hires once they’ve found the right match. Launched in 2015, CloudPeeps is considered a bit more exclusive and requires above average skills for a freelancer to join. It’s easier to get jobs, however, once you’ve been accepted into the marketplace. Despite its name, BloggingPro isn’t limited to blogging jobs at all. It’s basically a freelance writing job site where writers can apply for jobs that include content writing, proofreading, technical writing, copywriting, and editing, among others. The site also provides tips and strategies that will help you improve your blog if you have one; and above all, using the service is absolutely free. Founded in 1998, Journalism Jobs makes it easier for freelancers to search for gigs by curating all available journalism-related jobs in one big dashboard, eliminating the need for you to jump from one website to another. Some of the top companies who use the service to outsource jobs are National Geographic Magazine, ESPN, Time Magazine, MSNBC, and The New York Times. Freelanced.com dubs itself as the “freelance social network” with its website’s homepage layout resembling Facebook in more ways than one. Beyond the looks, the site does function as a social media site too with features that allow you to add friends and follow other people. The site provides a huge array of skills to choose from covering multiple industries like Marketing, Television, Arts, and Entertainment just to name a few. Relatively similar to 99 Designs, Design Crowd is a freelance job site made especially for designers. The freelance website offers a variety of design jobs with categories like web, logo, graphics, and shirt design, among others. A typical project begins with a design contest where hundreds of designers from around the world vie for a chance to win it by sending the client ideas and designs they can choose from. The name of the site says it all. Rent a Coder is a freelance job site for clients who are looking for developers, programmers, and even designers depending on the need. The site is unique and specifically caters to programmers be it for the web, mobile, or desktop. Codeable is a freelance job site specifically made for WordPress. In fact, it dubs itself as the #1 Outsourcing Service for WordPress because it only caters to clients who need an expert in WordPress. The hiring process is pretty much straight-to-the-point. A client needs to communicate his website needs or problems, an expert reaches out for questions and estimates, then the client decides which one matches his requirements and hires them. Unlike the more general freelance job sites, The Creative Loft is a job site solely for photographers. The job posts are categorized into specific project types like fashion, interior design, or event planning and can be either freelance, part-time, or even full-time. To begin, all you need is to create a profile and upload your resume with no additional costs. Once you’re in, you’re free to go through the different job postings until you find the project you’re looking for. Hireable.com is another freelance job site that provides clients with a platform to hire freelancers to help them grow their businesses. Based out of Irvine, California, the company allows clients to post jobs for freelance job seekers to search and apply for. One of the site’s best features is its ability to send personalized recommendations for job seekers by notifying them of job openings they may be interested in applying for. Belay separates itself from other freelance job sites by offering mainly virtual and personal assistant services to clients. Jobs offered on the site are generally remote and offers other services like bookkeeping and website management. The company also provides clients with a relationship manager to help onboard the newly-hired virtual assistants to make the transition smooth and hassle-free. Catered towards Moms, this freelance job site looks to provide new opportunities with flexible hours. With part-time, remote and freelance job listings, you’ll find resources and tools to help you land new work. Becoming a freelancer and working anytime, anywhere is no longer the risky move that it was a few years ago. With freelance job sites like the ones mentioned above, individuals have plenty of options to find gigs and clients to work with safely. When you think of yelp you probably think about people snapping photos of their boozy brunches and leaving reviews about restaurants. What most freelancers don’t realize is that clients use yelp as a way to find new freelancers and agencies to work with. Take advantage of the ability to market yourself on Yelp by creating a profile and listing your business under the appropriate categories. Yelp has categories for a number of creative services such as web design, graphic design and more. A Google Business Listing is another opportunity for you to be found, and look good for new potential clients. The first thing most people do when they hear about you is Google your business. Based on the location of your business listing on the search results page, it’s most likely the first thing they’ll see when they conduct that search. As the name would suggest, Free and Willing provides freelancers the ability to let prospective clients know that they are available for work. It’s a different approach than the other sites on this list. Rather than being found for listings through reviews, you indicate whether you are available to be hired. Although the approach is different, the fundamentals of being found online are largely the same. Set-up your profile and make it look good using visuals and adding as much relevant information as possible.